My business is called Pookledo. This incarnation was set up in 2009, but I’d previously been self-employed a few years earlier. I love making things and there is only so much I can make and give away to friends or swap! I’ve always liked jewellery and accessories as they are very universal items. I’ve always been plus sized and with jewellery it doesn’t really matter what dress size you are or age you are, you can always browse jewellery without getting down about your size or shape. Yes. I paid my way through college and university by making hand-made cards and selling them at craft fairs. After I finished my degree, I designed and made plus sized gothic clothes which was very rewarding for a while. I’m still working my full-time job as well as my self-employed work, but it’s getting to the point where there don’t seem to be enough hours in the day after I’ve finished my full time job to do everything I need to do for my self-employed business. Found a full-time job in a bead warehouse! I’ve learnt so much about beading and the jewellery industry working there that it has helped me so much in my self-employment. If something isn’t working for you, do some research and change things for the better. We’ve put in an offer for a small shop so, all being well, in a year’s time I’ll be working full time for myself. Doing something she loves and does well – check. Experience behind her – check. Committed to researching what can be improved – check. Tenacious – check. Finding it hard to squeeze in a day job and business stuff – check. I think it’s time for that leap of faith – and I really look forward to interviewing Sarah in a year’s time to find out how it’s all going! And here’s her 2014 interview! Visit www.pookledo.com for all the news and products, visit the Etsy shop, drop by and visit her Facebook page, read Sarah’s blog – and email her if you’d like to get in touch. If you’ve enjoyed this interview, please see more small business chat, the index to all the interviewees, and information on how you can have your business featured. If you’re considering setting up a new business or have recently done so, why not take a look at my new books. How do I print out table headings at the top of every page in Excel? I recently wrote about retaining your headers across multiple pages in a Word document. 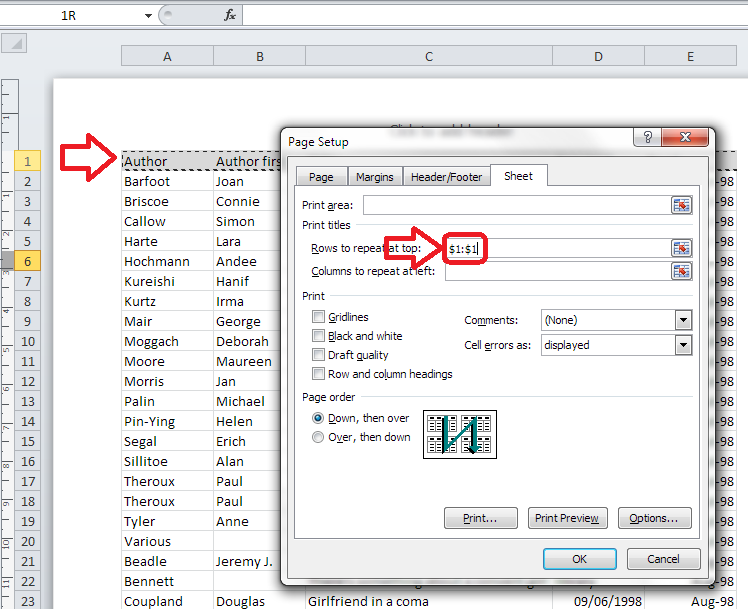 This post will tell you how to make your header rows (or columns) in Excel 2007 and Excel 2010 print on multiple pages when you print them out. What is the header row in Excel? The header row is the row in a spreadsheet that contains the headings for all of the columns in your spreadsheet. It’s usually Row 1, or maybe a few rows at the top of the spreadsheet. 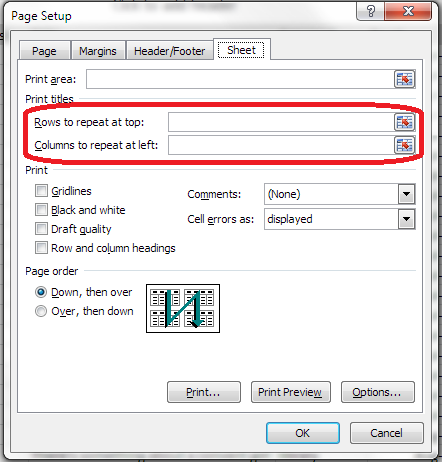 Why would I want my header rows to print out on multiple pages? If you’ve got a complicated spreadsheet that you want to print out in a report, as a handout, or as a pdf, it’s useful to have the header row show on every page. 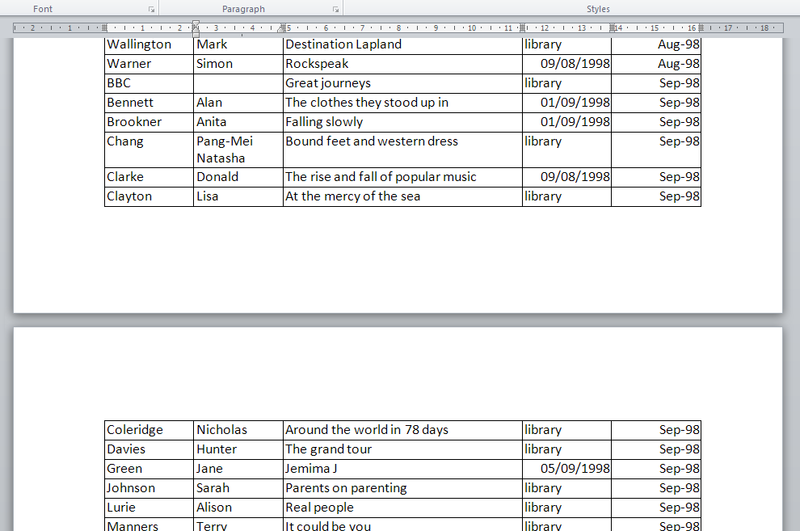 When you’re using Excel itself, you can freeze the rows and/or columns so you can see them as you scroll down. But this doesn’t carry over to the printout. How do I check if my header row will be printed on every page? 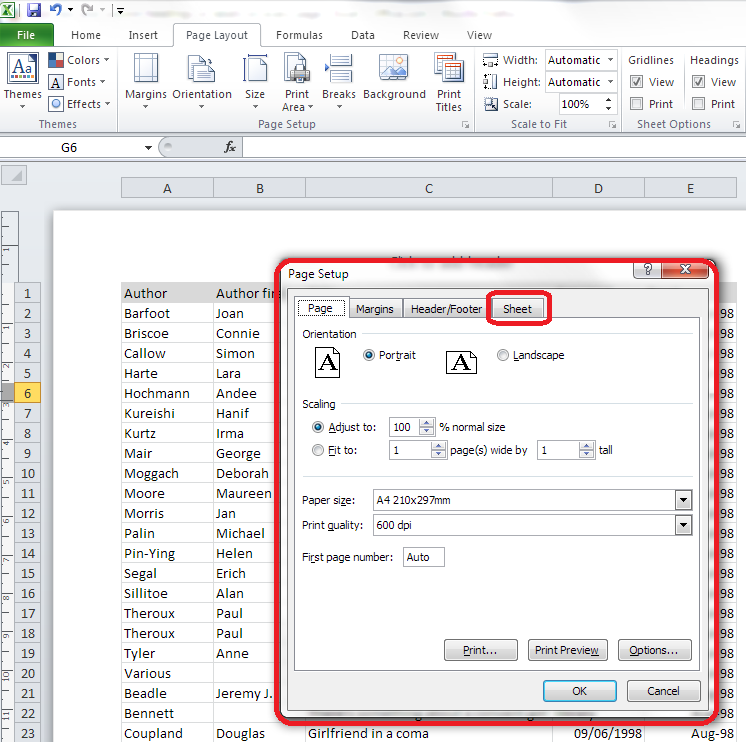 To check what the printout will look like, you need to change from the standard Normal view of your document (see the first image in this post) to the Page Layout view. How do I make the heading row print at the top of every page? Make sure your cursor is in the appropriate input box – in this case I have left-clicked with the mouse in Rows to repeat at top. Then click with the mouse on the far left of the row you want to select. Can you see the dotted line round it on the image below? That means that it’s been selected. If you just click on one row, $1-$1 will appear in the text entry box. If you highlight more than one row, it will read $1-$2, etc. If you want to make sure that a heading column appears on every page of your printout, make sure the cursor is in the Columns to repeat at left box and click above the column you want to choose. You can choose a row(s) and a column(s) if you want to! Once you’ve clicked on OK, you can scroll down in Page Layout view to see the top of the second page. 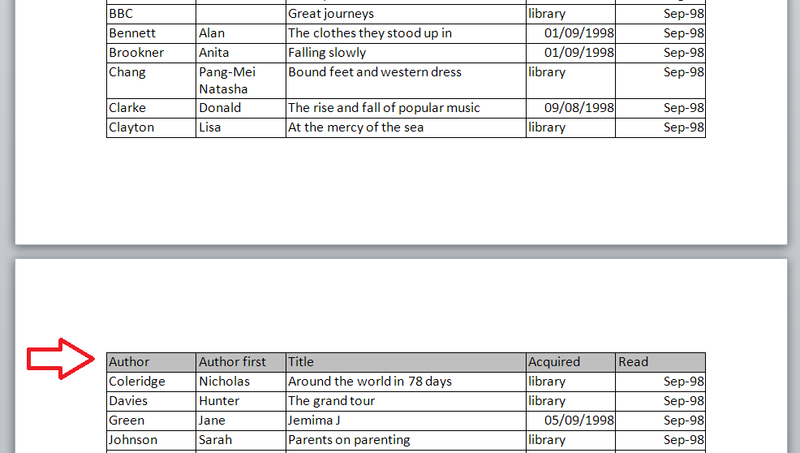 There are the headings, ready to print on every page! You can change back to Normal view: the instructions that you’ve given Excel here will stay the same. 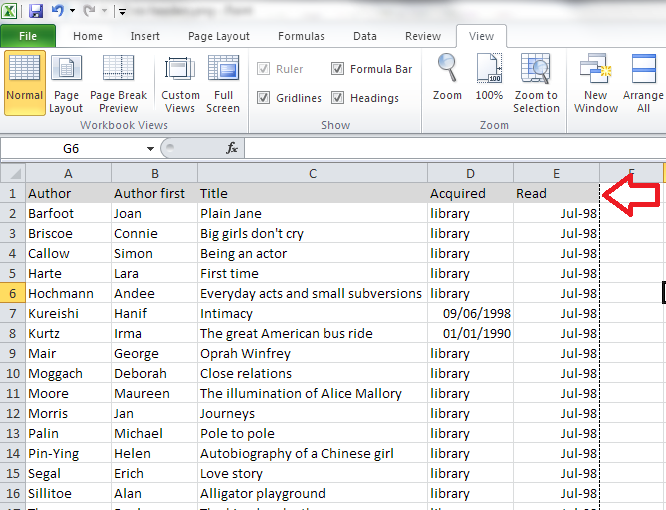 We’ve learned how to make sure that your heading row (or column) prints on every page of your printout when you’re printing out your Excel 2007 or Excel 2010 document. If you’ve enjoyed this post, please do share it using the buttons below! 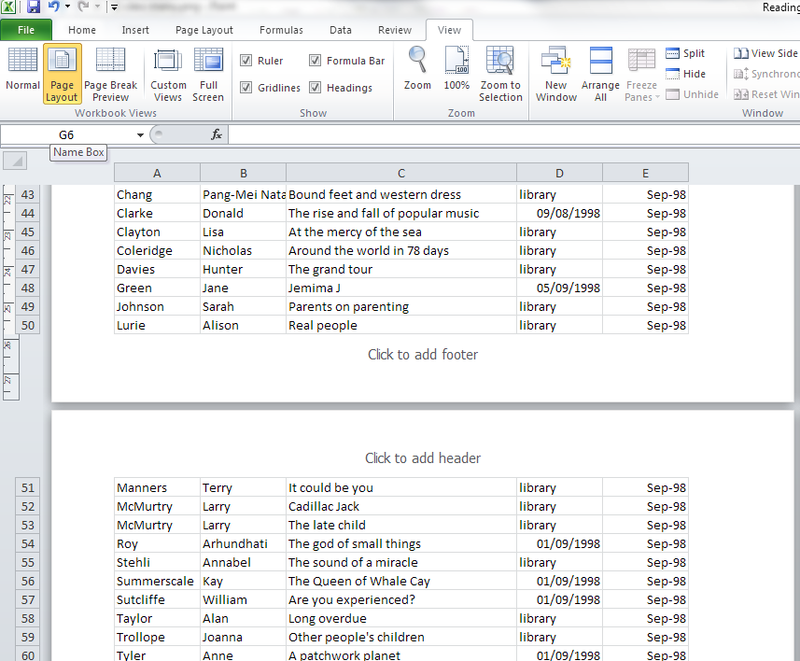 How do I keep my table headings over multiple pages in a Word document? Please note, these hints work with versions of Microsoft Excel currently in use – Excel 2007 and Excel 2010, for PC. Mac compatible versions of Excel should have similar options. Always save a copy of your document before manipulating it. I bear no responsibility for any pickles you might get yourself into! As part of my series on blogging, in this article I’m going to talk about how frequently to blog, keeping going, and how to get down to writing those posts. This is primarily aimed at people who are blogging for their business, but this advice applies to anyone who wants to build the audience for their blog and needs help getting down to writing posts and sticking to blogging. How often should you publish a blog post? Well, that’s up to you to a certain extent. But if you’re looking to appear high up in the search engine results and keep your readers happy, you should keep it regular. Most advice that I’ve read suggests posting at least twice a week. This will keep your readers engaged, keep your content updated enough for the search engines to promote it up their lists, and get enough keywords and content out there to keep your statistics nice and busy. Even a book review blog could do with a bit of livening up every now and again. A good example is my friend Ali – she mainly posts long-format book reviews, but she also takes up general topics or talks about book-buying trips – which varies things for her readers and gives them something new every now and again. I choose to vary things and give myself a structure by running series in different topics every week. I tend to publish a short Troublesome Pairs post about a pair of easily confused words or at present an article on blogging on a Monday, a Word tip or business post on a Wednesday, and I always run a Saturday Business Chat or Chat Update each Saturday. I don’t stick to this slavishly – this post is coming out on a Tuesday to avoid the bank holiday, but it helps me to structure things and means that there’s something for everyone every week (I hope). You don’t have to just publish text pieces, either. I’m sticking to text for the moment, but you can include video and audio pieces as well. This article by Joanna Penn of The Creative Penn has really good advice about when she schedules her text, audio and video content. Her blog is really popular, with loads of comments and great search engine optimisation, and if you’re planning on using different media, this would be a good plan to follow. I’ve talked about this a bit already in my article on Reciprocity in Social Media, but hosting guest posts (and having them on other people’s blogs, too) is a great way to spark up interest in your readers and get reciprocal links and readers. I’m going to write more about the etiquette of guest blogging soon. But again, it varies things a bit. I wouldn’t personally have a guest post more than once every couple of weeks. How do I remember my ideas for blog posts? If you’re anything like me, you’ll have ideas and inspirations for blog posts at the oddest moments. If I’m anywhere near my desk and PC, I pop into my WordPress platform and create a Draft blog post, sometimes with just a title, sometimes with a few jotted notes. If I’m learning something new (like turning footnotes into endnotes, just today), I’ll take screenshots as I go along, and save them ready to insert into a post on the subject. If I spot a picture I want to take or have a document with a feature I want to use, I take a photo and email it to myself or save the document in the relative folder. If I’m out and about, I use the note app on my phone to make a quite note of what I want to write about, or, if I’m feeling brave, I go into the WordPress app and create a draft from there! How do I organise my images for my blog posts? Because many of my blog posts are very screen shot based, and I always include some kind of image in my posts (looks good when sharing, attracts readers, etc. ), I have a folder in my Windows Explorer called Blog posts. This has sub-folders for all of the blog posts I write, or plan on writing, so I can pop screen prints and pics into the appropriate folder and know they’ll be there for later. 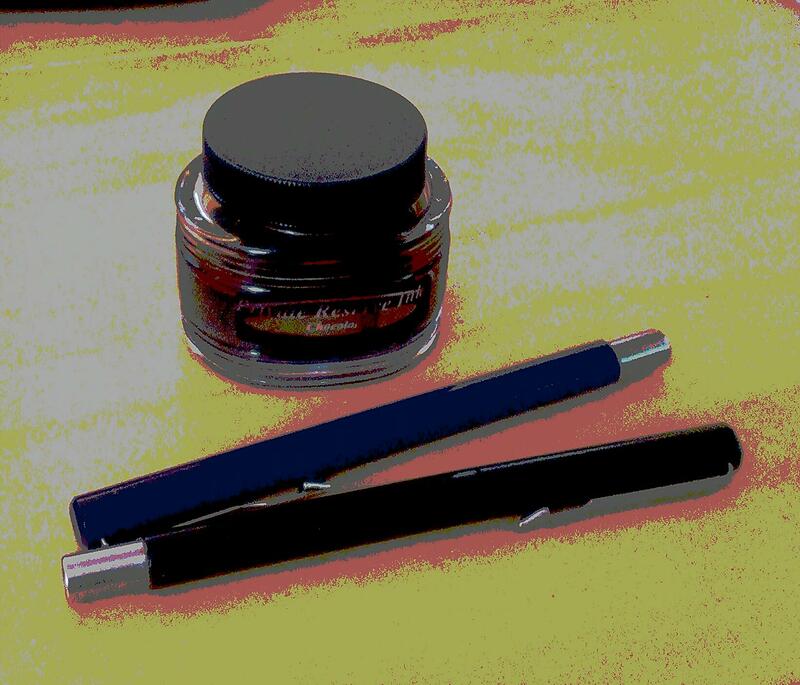 I have a set of generic pictures in the Blog posts folder, too, that I can use as images at the top of posts. 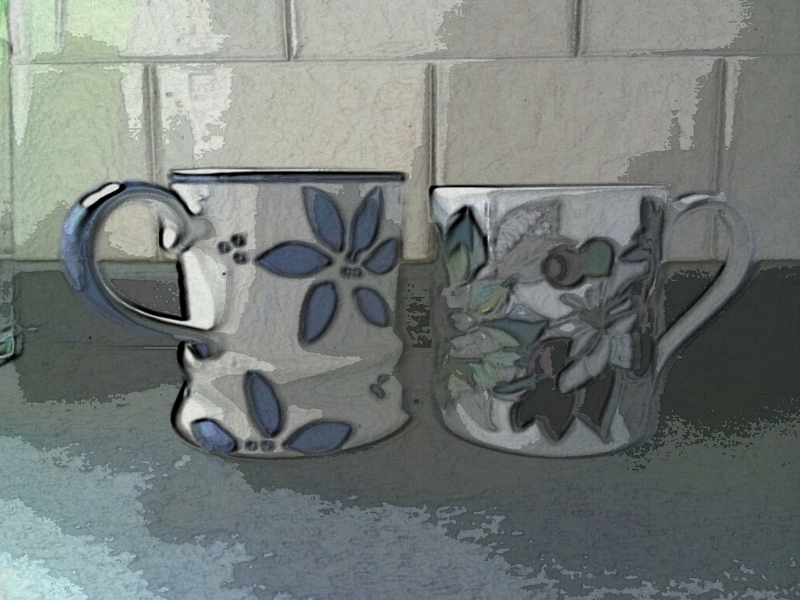 I prefer to use my own images to avoid copyright issues. How do I get down to writing my blog? Here’s my secret: blogging SESSIONS. You do not have to write your blog posts on the day you publish them! You can write them in advance, save them up, and publish in advance! I’ve always got some draft posts on the go – either because I’ve had ideas (see above) and not yet written them up, or I’m part way through a series and I’ve planned the whole thing out. So when I can see at least a 90 minute slot in my schedule, I’ll schedule in time to write blog posts. I’ll then bash through as many as I can, using my draft posts for inspiration and possibly already having pictures ready to go, either saved or inserted into the posts. Then I just need to write the text. In a good session I can get at least a week’s worth of posts ready in one go. I’m used to having to write because that’s some of what I do in my job. If you have to wait for inspiration to strike before you write posts … just make sure that inspiration has plenty of room to keep going! Anyway, it’s surprising what you can produce when you sit down and tell yourself that you have 90 minutes to generate a load of blog posts! 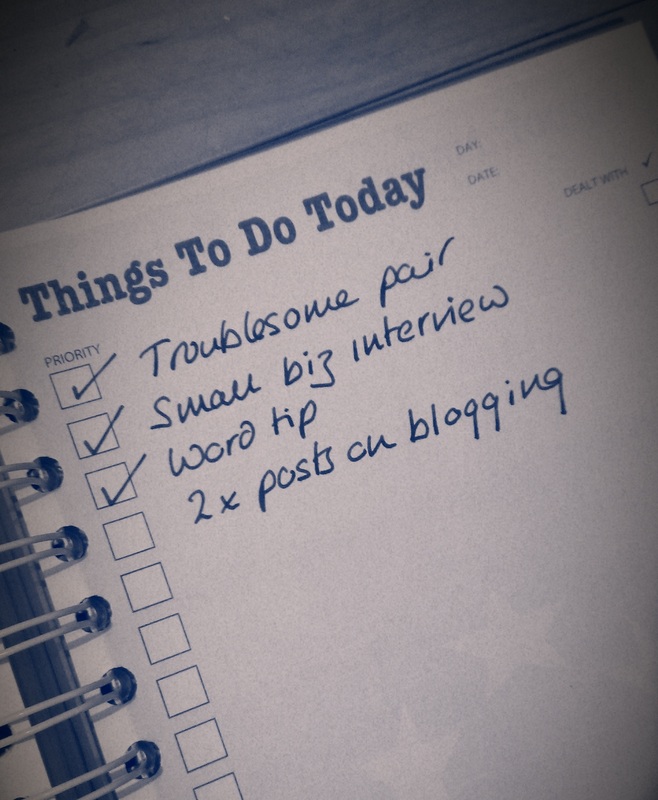 I would imagine that all blogging platforms have a scheduling feature. 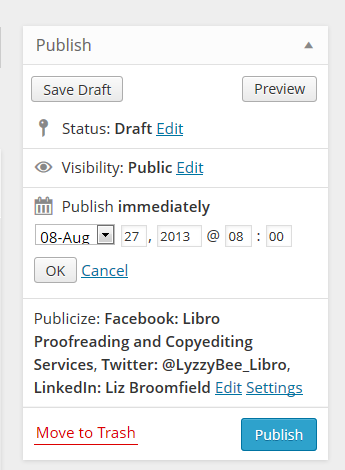 Here in WordPress, I can edit the Publish Immediately field to the right of my writing pane, and choose a date and time to publish the post (I also automatically post a link to Twitter, Facebook and LinkedIn. This means I can schedule a post to publish when I’m going to be away from my desk and the post will still be publicised). If you don’t know how to schedule blog posts on the platform you’re using, Google your platform name plus something like “schedule blog posts” and you should be able to find instructions. So, when I do a big writing session, I write the posts I want to write, then schedule them all in for the appropriate days. I can view just the posts I’ve scheduled to make sure there aren’t any clashes, then I can get on with work or even go on holiday, knowing that my blog will be publishing when I’m away. How do I make myself keep on blogging? This article has talked about how often to blog, how to organise your blogging, how to schedule posts and what to do if you get stuck. I’d love to hear your thoughts on these topics – do post a comment, and if you’ve enjoyed this post, please share it using the buttons below. Today we welcome a brand new interviewee to the Saturday Small Business Chat fold. Now that the series has been going for over two years, most of the posts will be updates. But I can always squeeze in a few new ones, and I’m delighted to welcome friend-of-a-friend Rozelle Faulkner from candle-making company, The Indigo Chick today. Rozelle is another interviewee who started her business for family reasons – we do seem to fall into three camps, don’t we: made redundant, fancied a change and doing it for the family, and she’s done her research and started to build a lovely – if very new – business! My business is called The Indigo Chick. I started up in May 2013 but didn’t start selling until I launched my website on 1st July. My daughter starts school in September and the plan was that I would be at home, but busy bringing up a new baby. Sadly, my son was stillborn, and I didn’t want to try to get a part-time job in case I got pregnant again. Self-employment seemed like the perfect solution. I originally wanted to make Teacup candles as gifts and thought it seemed easy. Once I started researching candle making (or ‘Chandlery’), I soon realised it was a very complex business and fraught with frustrations, yet highly rewarding. The quest to make ‘the perfect candle’ became my mission and it was only once I discovered that I was pretty good at it that I considered it as a business. I had been a demonstrator for the craft company, Stampin’ Up! a few years before. This required me to be self-employed but I mainly did it to fund my crafting obsession, so it didn’t really work as a business. “If you buy a new batch of wax, make a test candle first to ensure that it requires the same wick as the last batch”. I had no idea that the same brand of wax, bought from the same supplier, could vary in how it burned. I found that out after making over £100 worth of stock, which I then couldn’t sell. It’s one of the ‘joys’ of working with a natural material. Spent less money on numerous fragrances in the beginning. I would have been better off trying a few and finding out how different types of scent react in Soy wax before buying more. Taught myself Inkscape (free online graphics software) so that I could design my own logo and packaging. It was hard work and frustrating, but it saved me a fortune and I can’t put a price on how good I feel when someone compliments my design, knowing it was all my own work. It’s still early days for me and yet my business plan has changed already. I’ve added wax melts to my range and I’m currently working on introducing scented tealights too. The most difficult part is sourcing affordable recycled packaging. I refuse to go with the plastic boxes everyone else uses, as it just doesn’t fit with my ethos or my brand. I hope to have broken even financially. I would love to have a healthy database of clients who are repeat customers and are happy to recommend me and my products to their friends. You can find Rozelle’s lovely candles at www.theindigochick.co.uk, and email her or call her on 07578 486 669. She’s also on Twitter and Facebook. Please note, Rozelle is taking a rest from the business at the moment for personal reasons. We wish her all the best for the future, whatever she decides to do. Why would I want to repeat my header row on multiple pages? 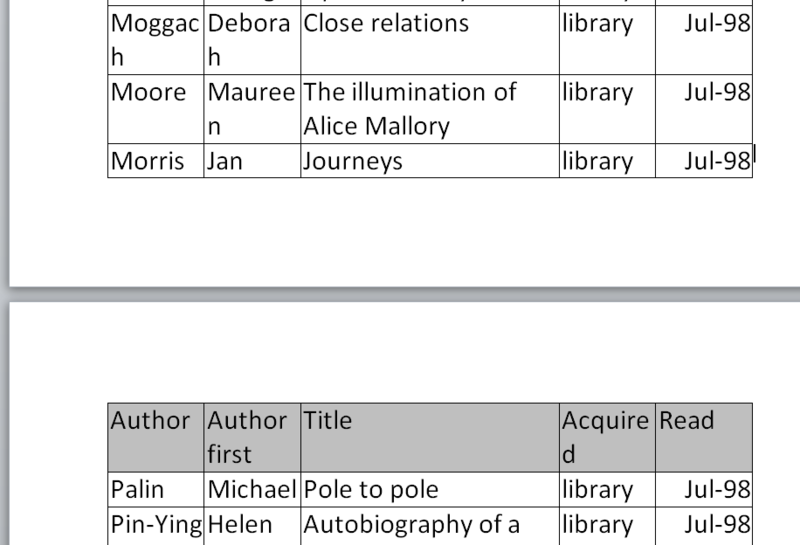 If you’re presenting a table which contains fairly self-explanatory information, for example, name, surname, book title, year, then you probably don’t need to repeat the heading row, even if the table runs across more than one page. 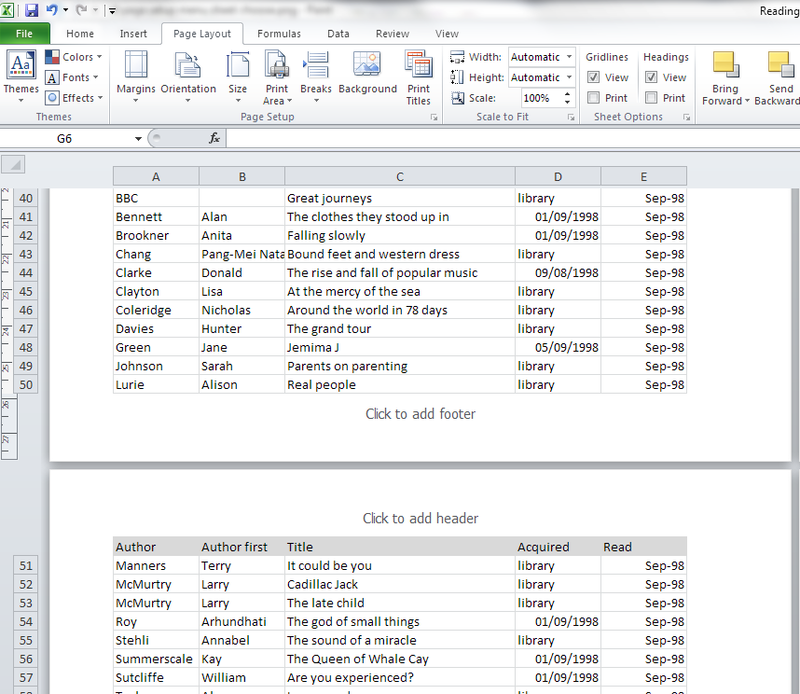 But if you think that the person who will consult the table will need to keep reminding themselves about what the different columns contain, it’s useful to add the header row at the top of each page. Doing this automatically rather than manually inserting a new row into each page of the table ensures that however much the table changes, the header row will stay at the top of each page. 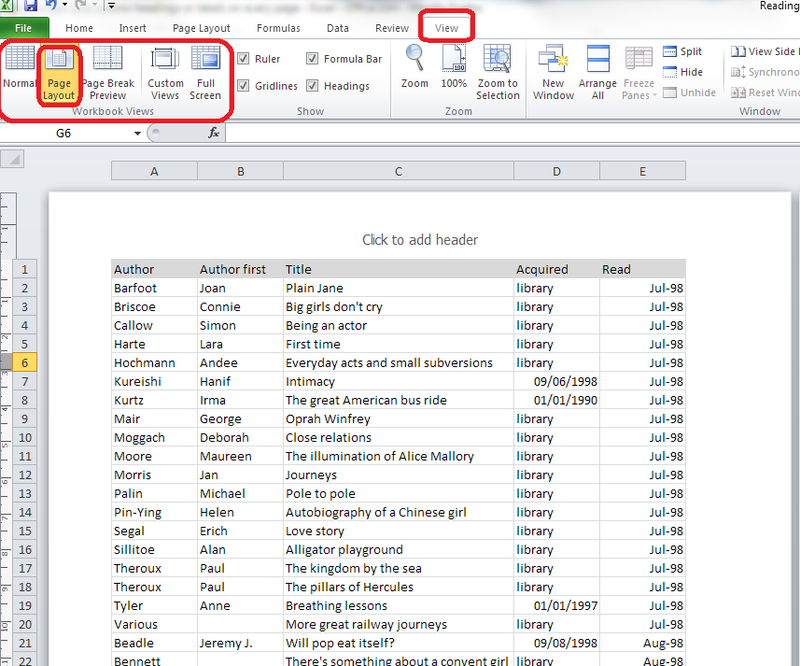 How do I repeat the header row in Word? Now, this is a long list, and it goes over more than one page. OK, it’s fairly self-explanatory, but I might forget what the Acquired and Read headers are. Click on the Repeat Header Rows button. Like magic, if you scroll down the page, you will now see that your header row is repeated! Note: if you don’t have a row selected, the Repeat Header Row button will be greyed out and you can’t press it. 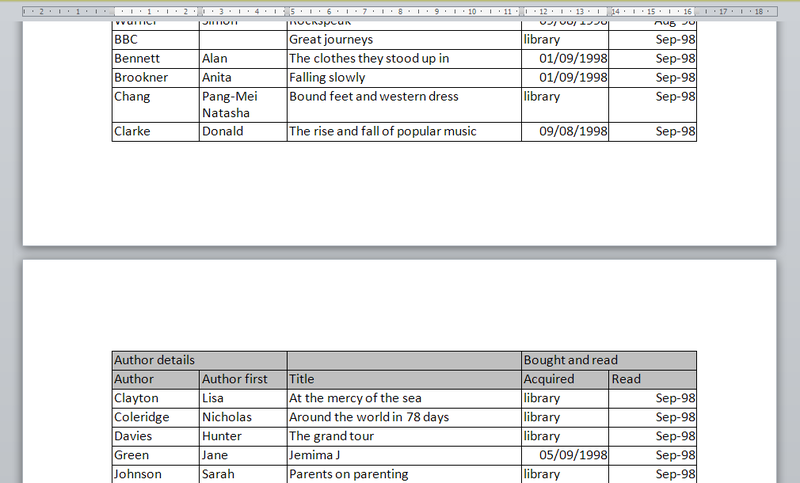 Here’s the magical thing: you can of course do this manually by inserting a row at the top of each page of your table. But then, if you move the text of the table around or resize it, you risk your manual header row not being the top row of your page. Using the automatic function means that, whatever you do to your table, the top row of a new page will always be the header row (UNLESS you force a manual page break). How do I repeat multiple header rows in Word? 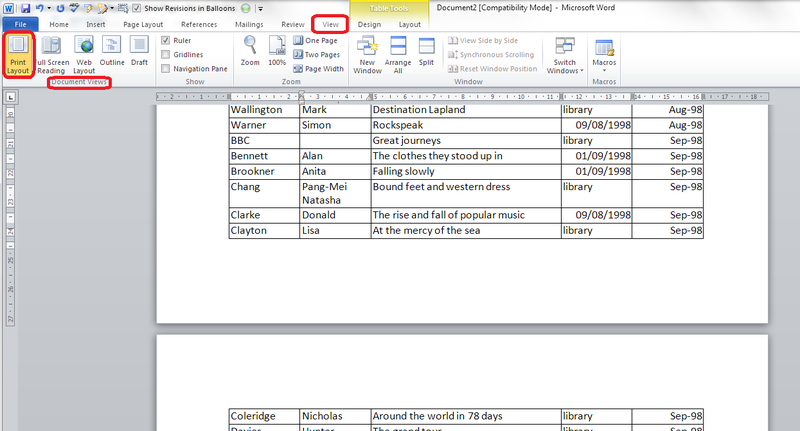 In Word 2003, you will need to use menus rather than the ribbon. Highlight the header row of your table. Select the Table menu and click Heading Rows Repeat. Today we’ve learned how to make the header rows repeat in a Word document. This is part of a series on Tables which I’ll be writing and publishing over the next few weeks. I’ve been talking about why and why not to blog recently. Once you’ve committed to your blog, it can be a bit of a minefield. Here are the top ten blogging sins that I see over and over again, or hear other people complaining about. No one can be expected to know everything straight away, and we’ve probably all made at least one of these mistakes, so hopefully I’ll help you to avoid the big, bad ones with this list. RSS is a way to allow blog reader software to collect your content whenever it’s updated and send it on to any of their readers who subscribe to your blog This Wikipedia article explains it all and examples of RSS readers include Feedly. If you look at the top of this blog page, you will see that I have an RSS feed logo in the top right-hand corner, and a link in the right-hand menu bar, and I also offer a link to subscribe by email. All blogging software will have something in their settings that allows you to add this. If you don’t add this link, it makes it that bit harder for people who want to subscribe to your blog to do so (they can usually put the URL in their reader software, but are they going to do that extra process? Not always). Not having a button to use to do it quickly and easily can give the impression that you’re not interested in people reading your blog. That’s probably not true. But I’ve seen people get really cross about this and say that they’re not going to look at a person’s blog any more if they don’t have this. I know … but if one person’s saying it, how many are thinking it? If you get stuck trying to add this button to your blog, the easiest way to find out how, is to Google your blogging software’s name and “RSS feed button”. You should find a YouTube video or set of instructions telling you how to do it. If you set up a blog and you then don’t update it, it won’t help you to get more readers or to promote whatever it is you’re promoting. Google and the other search engines thrive on updated, fresh content. If you don’t update your blog regularly, it will fall further and further down the search rankings and no one will be able to find it. If you want to write a blog, commit to updating it regularly. I’ll be publishing a post about scheduling and keeping active with your blog posts soon, so watch this space! It’s fine to “reblog” other people’s blog posts onto your own blog (where a snippet of the post appears on your page, with a link to the real thing). It’s fine to link to other people’s blog posts and tell other people about them. It’s even fine to be inspired by another person’s blog or content – one of my friends has started a questionnaire series a little like my Small Business Chat one but with an emphasis on marketing techniques: similar idea, different content, that’s fine. It’s not fine to lift content wholesale from another person’s blog or website. If you quote large amounts of text written by someone else, it’s just the same as if you were using that in an article or essay – you need to reference where it came from and acknowledge the author. It’s fine to talk about newspaper articles or reports in your blog and react to them, not fine to quote them verbatim, or quote people they have quoted, and not give the original source. Never be tempted to take someone else’s content for your blog post. At best, you won’t get picked up by the search engines anyway (see below). At worst, you’ll find yourself slapped with a lawsuit for plagiarism! And it’s just not right. Say you’ve had a guest post on someone else’s blog and you’re really pleased with how it’s turned out – so much so that you want to share it. So you post it in its entirety on your blog, too. Not a good idea. All of the search engines, like Google, like to offer their users varied content. So if the same content appears in two places, both places won’t come up in search results. Effectively, one of them will be invisible to search engines, therefore invisible to people searching for keywords that might lead them to that content. To look at it from a different viewpoint, if you’ve published information in a guest post, the owner of the blog you’re guesting on will want to be posting up original content, not things that can be found elsewhere. Some people actually specify that the content must be original in their guidelines for guest posters. See more about this in a week or so when I blog about guest posts. How do you deal with this? Publish a snippet of the post on your blog, with a link to that post. Put some of your own text around it, then the search engines will find your post and your guest post, both of you will get found and viewed, and no one’s copied anything. There are clever ways to deal with all of this in the coding behind your blog, but I’m guessing that most of us aren’t the kind to deal with that level of complication – I’m certainly not! I feel like a bit of a hypocrite writing this, because obviously this post is a little bit negative. But I’m also genuinely trying to help people to avoid making common mistakes! In the same way, I tried to make sure that my 10 reasons not to write a blog article talked about reasons for reviewing your blogging and content and making a positive decision. Whining and moaning and relentless negativity won’t make your readers like you any more than they would like you in real life. Being rude can get you views in the short term. But it’s like those restaurants that people go to only because the waiters are desperately unfriendly. Fine for a laugh: but will they go back regularly for birthdays and anniversaries? Probably not. Even ranty blogs about politics or issues have to be constructive as well as rude! If you want to have a rant or talk about a mistake you’ve made, try to vary and space out these posts, and make them as constructive as you can. We can all get a good blog post out of a bad experience, but make sure that you and your readers come away having learned something. I’m going to post soon about managing your social media brand, and this comes very strongly into that, too. I don’t just mean lurid or dirty pictures here. If you want to share information about your management courses, then blogging about your exercise classes won’t get you the audience you want to buy your courses, unless you’re doing some very clever keyword placement and making the articles valuable to both groups of readers. I have to admit to having a laugh at funny spelling mistakes as much as the next person. However, I’m careful not to mock or talk about or post pictures on this blog, because a lot of the people I work with as an editor are unsure about their English and using it as a second, third, fourth language … and would be mortified if they thought people were laughing at them (I don’t laugh at their English: I know I couldn’t do half as well as my overseas clients if I was writing in my second language. Bong joor toot le world). If someone takes the time to write a guest blog post for you to to give you more, fresh content, bring their fans over to your website, give you a marketing opportunity, etc., etc., then you need to do certain things to make the experience a good one on all sides. Chief among these, and something I see people having issues with all the time, is making sure that you provide live links back to their website and whatever it is they’re promoting, be it another website, their book on Amazon, or whatever. A live link is one that your readers can click on and be taken to their page, like this one which takes you to a post I wrote telling you how to add links to your blog posts! Formatting guest posts that have come through in an email or an attachment can be tricky, full stop. I recommend pasting the text into a Notepad file on your computer, then pasting it from there into your blog post. Lots more on this in an upcoming article. But please make your guest blogger’s links live so that your readers can visit them online! I like responding to blog posts. We all like responding to blog posts. We like to feel it’s a two-way conversation when we read something online, don’t we. But I still come across blogs every day that either don’t allow any comments at all, or make the commenting process so complex that people give up. I have to say that the blogging software can be a culprit here. I can never seem to reply to Blogger posts, and WordPress itself can give the impression that you have to sign up to a WordPress account in order to comment on one of its blogs (you really don’t, you just need to add your name and email address). Enable comments, even if you moderate and check all of them for spam (most blogging platforms allow you to set the level of moderation, for example, I hand-moderate the first post by anyone, and am alerted to all new comments, so I can check they’re not spammy or inappropriate). And listen to your readers – if you’re getting complaints about how hard it is to reply to a post, have a look at your settings and see if you can make it easier. One of my blogging friends has a note whenever you go to comment with an email address to use if the process won’t work – very helpful! Allied to the above, if people take the time to reply to your blog, it’s only polite to take a moment to respond to them. Some people who get a lot of comments will do a general reply mentioning all of the previous commenters with a sentence addressed to them, and that’s of course fine. But I get a bit frustrated if I comment thoughtfully on a blog post and the author never responds. You don’t have to do it immediately, but I try to do it within 24 hours, a couple of days at most. Conversations on your blog can be one of the most interesting things about blogging – so get out there and engage with your readers! Which blog will you go to once, to find a plumber? Which one will you bookmark and read, share and tell other people about? Which one will actually bring the plumber more business in the long term? I give away quite a lot of free advice on my blog, but just because I tell people how to set up a table of contents doesn’t mean that none of my clients ever ask me to do that now. On the contrary, seeing my expert advice, they trust that I can sort it out for them! That’s my personal top 10 list of blogging sins. Would you add any to that? Are any of those NOT sins in your book? I’d love to know what you think, and whether you’re enjoying this new series of articles all about blogging! You can find a growing set of articles on blogging and social media in the resource guide. Do click on the share buttons below or comment if you found this article interesting or useful!